SKY LIGHTS – Page 527 – The only good night lights are billions of miles away. A recurring celestial drama is playing out in the southern sky. Every Winter through Spring, Orion (The Hunter) and his faithful companion Canis Major (The Big Dog) chase Lepus (The Hare) across the celestial sphere. 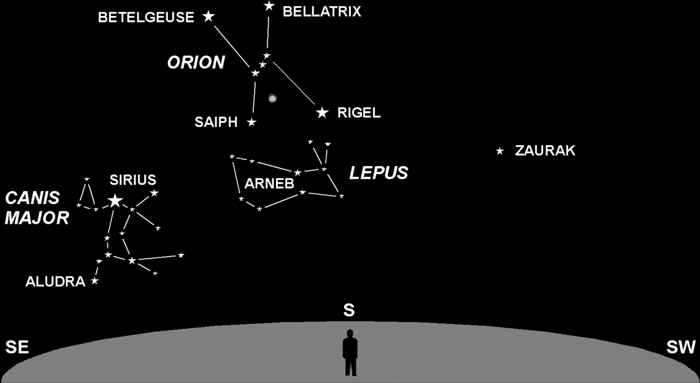 Orion is easy to spot — it’s one of the five most prominent constellations. His dog is composed of mostly fainter stars, but includes Sirius, the brightest star in our sky. Legend says Sirius marks the dog’s chest; I like to think of it as his shiny “dog tag.” The rabbit is the faintest of the three, and you’ll need clear dark skies to see it. Canis, of course, goes purely by sense of smell and can track his prey easily in the dark. Alas, though pursuing The Hare tirelessly for eons, Big Dog has gained little ground on his prey. Of etymological interest, the name “Sirius” translates as “scorching.” During July and August it is near the Sun (directionally, that is, not physically). The ancient Egyptians believed its added heat caused the long hot days of that season. Sirius is thus known as ‘the dog star” because of the linguistic connection between the “dog days” of summer and the name of its host constellation.